In game one of a doubleheader, the Sea Dogs nipped the Curve. Mike McCarthy started and allowed a run on four hits and three walks over three innings. Brandon Workman allowed two runs on three hits and five walks in just 1 2/3 innings of work. It was his first rehab appearance with Portland. Ty Buttrey (1-9) earned his first win of 2016, hurling 1 1/3 scoreless inning of relief. Down, 1-0, in the third, Portland plated runs on a Mauricio Dubon RBI single and a passed ball. Tied, 3-3, in the fifth, the Sea Dogs scored the winning run on a Dubon RBI single. 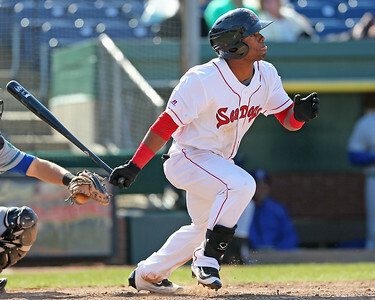 Aneury Tavarez (pictured, above right) was 2 for 3 from the top of the order for the Sea Dogs. In a makeup of a 5/22 rain out, the Sea Dogs fell to Altoona. Jalen Beeks took the loss, allowing five runs on seven hits and three walks in five innings of work. Williams Jerez allowed two runs on two hits and a walk in two innings of relief. All four Portland runs were scored on home runs, as Dubon laced a two-run shot in the third and Cole Sturgeon smacked a two-run homer of his own in the fourth. Dubon and Tavarez were both 2 for 3 in the loss. The Red Sox held Carolina to just one hit as they won their sixth in a row. Daniel McGrath hurled eight innings, allowing one run on one hit and two walks while striking out five. Jamie Callahan finished the contest, tossing a scoreless inning of relief. Down, 1-0, in the second, the Red Sox tied the game on a Jordan Procyshen sacrifice fly. In the fifth, the Red Sox took a 3-1 lead on a Deiner Lopez RBI single and a run-scoring wild pitch. In the eighth, Salem capped the scoring with a two-run RBI double off the bat of Jose Sermo. Bryan Hudson, Jayce Ray, and Mike Meyers all had two hits in the victory. A seven-run 14th inning propelled the Intimidators past Greenville. Logan Boyd received the start, allowing a run on five hits while striking out six in six inning of work. Stephen Nogosek took the loss, allowing six runs (five earned) on four hits and two walks in just one inning of work. The Drive mustered just five hits, plating a run in the third on a Luis Alexander Basabe RBI triple and one in the eighth on a error. The Drive will try to salvage the series tomorrow at 7:05. Coming off the All-Star break, the Spinners found themselves on the wrong end of a shut-out. Michael Shawaryn, a fifth-round pick in 2016, made his third start of the season, allowing just three walks and striking out four in 2 2/3 innings. Daniel Zandona took the loss, allowing three runs (one earned) on three hits and two walks in 4 2/3 innings. Andy Perez had two hits in the loss. A late-inning rally boosted the Red Sox. Hildemaro Requena allowed an unearned run on two hits and two walks, striking out six in five innings of work. Max Watt picked up his first professional victory, allowing just two hits and a walk in two innings of relief. Angel Padron picked up his fourth save, adding two scoreless innings of relief. The Red Sox took a 1-0 lead in the second on a Imeldo Diaz sacrifice fly. With the game tied in the sixth, the Sox grabbed a 3-1 lead on a Raiwinson Lameda RBI double and a run-scoring error. The Red Sox tacked on another run in the eighth on a Lameda RBI single. The Rays took advantage of their opportunities in the victory. Juan Perez took the loss, allowing five unearned runs on five hits while striking out two in five innings of work. Antonio Police allowed two runs on one hit on three walks in three innings of relief. Carlos Cortes added a scoreless inning of relief. Down, 5-0, in the fifth, the Red Sox got on the board on an Ivan Jimenez RBI double. The Red Sox scored another run in the sixth on an error. In the eighth, the DSL Sox capped their scoring on an RBI triple by Marino Campana. The DSL Red Sox2 rode a strong game from Yeison Coca on their way to a victory. Luis Rivero picked up the victory, improving to 4-1. He allowed two runs on five hits while striking out five in six innings of work. Rafael Gomez picked up his third save, allowing a hit and two walks in his lone inning of relief. Coca was 3 for 4 with three runs scored and a triple in the victory. Pedro Castellanos was 2 for 2 with an RBI. Player of the Night: Aneury Tavarez, who led the Sea Dogs to a doubleheader split by going 4 for 6 with two runs scored, gets the call. Tavarez has been hot lately, going 19 for 37 with two home runs and ten runs scored in his past ten games. The 24-year-old outfielder has hit .333/.384/.497 with five home runs and 37 RBI in 94 games between Pawtucket and Portland this season.